After days of watching the displays of elegant Olympic athleticism, with soaring gymnasts, unbelievably synchronized tandem divers, chiseled swimmers slicing through the water in hot pursuit of world records, and the many other sports that exemplify the glory and beauty of the human form, I've had about all I can stand. And there's no better cure for Olympics overload that I can imagine than Monster Trucks! Thanks to Car and Drivers' feature, The Physics of: Monster Trucks, I can escape the sublime Olympic celebration and wallow in the brutal, filthy destructiveness of all manner of absurd mechanized behemoths, while pretending that I'm learning something useful - like how much force Bigfoot exerts on the roof of a Crown Vic as it comes careening back to earth at the end of a ten meter high leap. What a relief. One more inspirational story of some athlete rising to the pinnacle of their sport through a myriad of heart-wrenching challenges would probably have made my head explode. Yeah, yeah, I'll be glued to the screen tonight watching the Olympics until NBC ends it's broadcast at midnight. 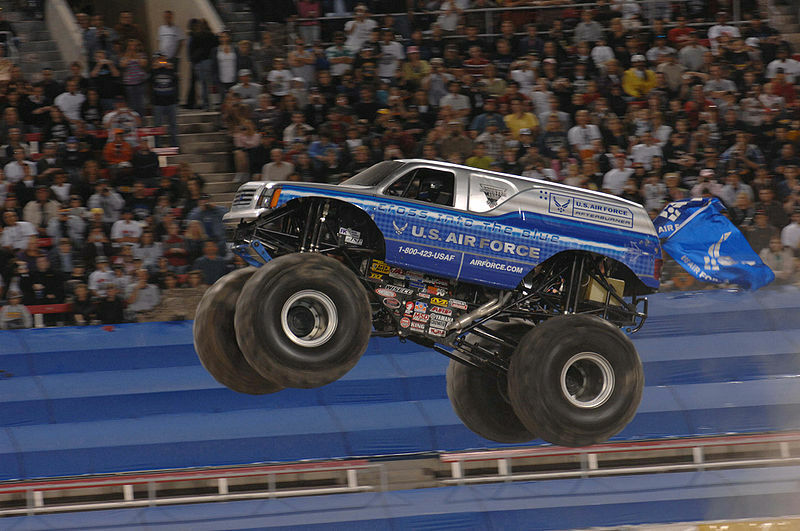 But if it gets to be too much, I'll close my eyes for a few minutes and imagine some strut blowing, axle bending, ear shattering monster truck destruction, just to keep things in perspective. Methinks there something amiss with the math. I haven't run the numbers. Where's the error you're referring to? Back of the envelope check seems to work out ok.